New member applications for presentation to the Board of Governors for the Summer enrollment period must be postmarked no later than June 1, 2018 Applications received after that postmark date will be held for presentation at the Fall enrollment period September 2018. Note that if you are interested in applying for a DSDI Scholarship Award for the 2019-2020 school year, you must be a member in good standing by the end of the Fall 2018 application period If you are thinking of applying for the Scholarship and are not presently a member, I encourage you go apply sooner rather than later. If you are a member and applied for the 2018-2019 Scholarship, your dues must be current by June 30, 2018 or you will not be eligible to receive a scholarship. Many families have stories tying their family to one of the Signers of the Declaration of Independence. Unfortunately many of those stories will not survive genealogical scrutiny. The links on the left will explain in great detail what you would need to do to qualify for membership in the Society. An item of confusion we see frequently is the difference between “related”, “collateral descendant” and “descended”. If you think you are related to, or a collateral descendant of a Signer, you are not eligible for membership in the Society. The Society does not maintain genealogies on Signers relations. We are asked questions about Signers possible relations all the time and we simply cannot address them. What is the difference between related, collateral descendant and descended? If you are a grand child, great grand child, etc. you are a descendant. If the Signer is a cousin, great uncle, etc, you are related to or a collateral descendant of the Signer. Another question we get from time to time is what about DNA evidence. The Society is an organization of documentation. We do not accept DNA as proof of descent. If you are a descendant, you will need to provide documented evidence of that relationship. 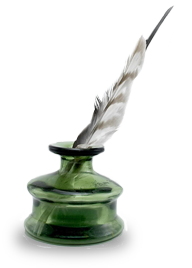 There are several good sources of genealogical data on the Signers descendants. A source document, The Leach Manuscript, may be seen on microfilm at any LDS Family History Library, in Salt Lake City, or in more than 3,500 Family History enters located around the world. For the FHC nearest you, visit Family History Centers. If you think you are a descendant of one of the New England signers, a great resource is the New England Historical and Genealogical Society. In addition, there is a seven volume series, The Genealogical Register of the Descendants of the Signers of the Declaration of Independence, by The Rev. Frederick Wallace Pyne. These volumes are arranged by Regional grouping, starting with New England (Vol. 1), ending with Georgia (Vol. 7) . Each volume contains detailed genealogical data on the descendants of each Signer from that State. The publisher of Picton Press has died. The books may be available from the Rohrback Foundation. If you think you are a descendant, download the application form, follow the instructions and submit the form. We look forward to hearing from you. While the sources referenced above are thorough, they are not complete. You may be able to add to our knowledge of the descendants. Only 15 of the 56 signers have male descendants today. These Signers have no descendants: William Whipple (seven children, all died with the first year of their life), John Hancock (two children, one died at 1 year, the other at age 11), Samuel Huntington (raised two adoptive children, had none of his own), James Smith (five grandchildren, none had children), James Wilson (one grandchild, never married, had no children), Caesar Rodney (never married, no children) , George Wythe (one child, died as newborn), Francis Lightfoot Lee (had no children), Joseph Hewes (never married, had no children), Thomas Lynch, Jr. (he and his wife died at sea, no children), Button Gwinnett (had one daughter, who had no children), Lyman Hall (one son, never married, no children), and George Walton (one great grandson, George Walton Reab, a bachelor, no children). Each month we get applicants stating that they are a descendant of one of the above named signers. To date, no one has been able to prove their claims. There were several James Wilson’s in the Philadelphia area during the Revolutionary period and we get applications for James Wilson, but they are not descendants of James Wilson, the Signer. These Signers have no same surname (male) descendants: Samuel Adams, Samuel Chase, Benjamin Franklin, Elbridge Gerry, William Hooper, Thomas Jefferson, Francis Lewis, Thomas McKean, Robert Morris (see note below), John Penn, George Ross, Benjamin Rush, Thomas Stone, George Taylor, Matthew Thornton, and William Williams. We get applications from George Clymer “descendants” , but they do not pan out. The reason is that there is a branch of George Clemmer, from the Germantown region of Pennsylvania. Over time the Clemmer has morphed into Clymer. To date, none of these applications has passed genealogical muster. Josiah Bartlett is another source of applicants that do not pass muster. The reason is that a lot of Bartletts settled in the same county in New England, and while some folks may be related to Josiah, few are descended from the Signer. We also get applicants stating that they descend from William Ross, the grandson of the Signer, George Ross. The Signer did have a grandson, William Ross. But William never married and died without children. Unfortunately, there are some SAR documents from an earlier time who provide full genealogical information on a William Ross. Both Williams were born the same year, one in Lancaster County, PA, one in Cumberland County, PA (you will also see this as IA). The one born in Cumberland county died in Illinois. The grandson of the Signer died in Lancaster, PA and the death year is different for each. This is just a good example as to why you must be very careful of genealogical information you find on the web. It is not quite as easy as The Genealogy Roadshow would have you believe. Robert Morris surnames. While there are descendants of this Signer who do carry the Morris surname, they are not straight line male descendants. One of the grand-daughters did marry a Morris and the name does come down to current times, but no male Morris sons or grandsons exist in current times. In addition, according to DAR records, there are four other Robert Morris Patriots from the Delaware Valley. We get frequent requests for membership from one of those men’s descendants. In this cases, we have to say no. If you think you might be a descendant of one of these men, I recommend that you contact the Pennsylvania Historical Society in Philadelphia as they have extensive genealogical records on this period of time. These Signers have very doubtful same surname (male) descendants: Carter Braxton, Abraham Clark, William Ellery, Stephen Hopkins, and Oliver Wolcott. 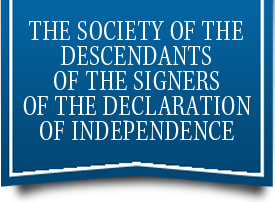 The remainder of the Signers are known to have same surname (male) descendants. In order to apply for membership, you should READ THESE INSTRUCTIONS FIRST. Download the application in PDF format. Download the application in Word format. Download the application in WordPerfect format. Complete the form online, make 2 copies, keep one for your records, send one to the Registrar-General. If you have any questions about the membership process, please contact one of the officers or simply send us an email.